Good news for equipment companies and service suppliers during the past week included encouraging development projects in South Korea, Ethiopia and PNG, plus a clutch of positive announcements in Canada and Australia. Bluebird Merchant Ventures Ltd expects to get permits during the current quarter to develop and mine the Kochang and Gubong past-producing gold mines in South Korea. The Gubong tenements have been transferred recently to the joint venture with Southern Gold Ltd, and the tenements for the Kochang mine are expected to be transferred soon. The company is assessing the use of a single processing plant for both operations to save capital expenditures and working capital, and a decision on plant design and location is expected by the end of June, with construction scheduled to start in the third quarter. Ethiopa's Ministry of Mines and Petroleum has approved mining agreements for East Africa Metals Inc.'s Mato Bula and Da Tambuk gold projects. East Africa now has three advanced development gold projects in close proximity and has the necessary transportation and power infrastructure. The company had outlined the results of three separate preliminary economic assessments of the Mato Bula, Da Tambuk and Terakimti projects, with internal rates of return of 28% to 30%. Mato Bula and Da Tambuk are part of the company's 100%-owned Adyabo property. Terakimti is on its 70%-owned Harvest property. Feasibility work announced during the past week included Mayur Resources Ltd's definitive study for the Central cement-lime project in Papua New Guinea. The project has an estimated net present value, discounted at 9%, of US$352 million. The capital cost is estimated at US$331 million for a 30-year operation with a capacity of 1.65 Mt/y of clinker. Canada's Minister of Environment and Climate Change, Catherine McKenna, has approved Argonaut Gold Inc.'s environmental assessment report for the C$427 million Magino gold project in Ontario. The Canadian explorer is now required to secure additional authorisations from federal departments. Emerging Australian lithium developer, Core Lithium Ltd has awarded a preferred contractor status for three key components of the company's 100%-owned Finniss lithium project near Darwin in the Northern Territory. In line with its construction schedule, Core is targeting first production of spodumene concentrate from Finniss by the end of this year. The company has engaged Primero Group as the preferred Engineering Procurement and Construction contractor. Project financing announced last week included an announcement by Orion Minerals Ltd that Tembo Capital had extended a new, unsecured, A$3.6 million bridge loan. The proceeds will be used on a bankable feasibility study for the Prieska zinc-copper project in South Africa. A scoping study, released in December 2018, outlined a net present value, discounted at 12.5%, of between A$400 million and A$440 million. KEFI Minerals Plc announced that ANS Mining Share Co., an investor in KEFI's Tulu Kapi gold property in Ethiopia, has pledged to increase its investment in the project company to the local currency equivalent of US$38 million from US$30 million. KEFI noted that its government-sector project partner, the Ethiopian Ministry of Finance and Economic Cooperation, has started engineering for construction of the off-site infrastructure. KEFI is targeting the second half of 2020 for the initial gold pour at Tulu Kapi, which is expected to produce 140,000 oz/y for seven years with all-in sustaining costs of about US$800/oz. Vedanta Resources Plc plans to invest US$1.2 billion in South Africa in addition to the US$400 million already invested in the country. The majority of this investment will be used for the second and third phases of the company's 74%-owned Gamsberg zinc project. The company invested US$400 million for the first phase of Gamsberg, which started in mid-2016, and production of finished zinc concentrate started in late 2018. Vedanta is currently undertaking a feasibility study to build a greenfield, state-of-the-art smelter and refinery as part of the Gamsberg project. AVZ Minerals Ltd plans to raise A$5-10 million through a fully underwritten share purchase plan to advance the Manono lithium-tin project in the Democratic Republic of the Congo. Funds will be used to fast-track predevelopment activity at Manono, including a definitive feasibility study. Crater Gold Mining Ltd is looking to raise A$23 million via an entitlement share issue. 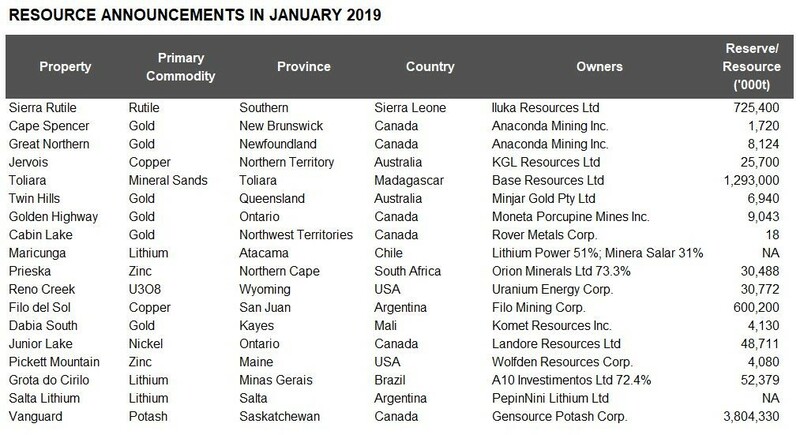 Some of the funds will be used to advance the HGZ mine at the Crater Mountain gold project, and for exploration at the Croydon gold project tenements in Queensland, Australia. Early-stage announcements last week included news that Highfield Resources Ltd has secured proved and probable reserves at its Muga potash project in Spain of 108.7 Mt grading 10.2% potassium oxide. The reserve estimate used a cut-off grade of 8% with a maximum waste salt content of 30%. Highfield noted that it has completed all the necessary work required for environmental approval. An independent preliminary economic assessment for Vendetta Mining Corp.'s Pegmont lead-zinc project in Queensland, Australia, outlined a net present value, discounted at 8%, of A$124 million. Condor Gold Plc has updated the mineral resource estimate for its wholly owned La India project in Nicaragua. The project hosts an indicated resource of 9.9 Mt at 3.6 g/t gold, containing 1.1 Moz, and an inferred resource of 8.5 Mt at 4.3 g/t gold containing 1.2 Moz. Jangada Mines Plc has announced a 117% increase in the JORC-compliant resource at its Pedra Branca platinum group metals project in north-eastern Brazil to 74.8 Mt at 1.31 g/t palladium equivalent. Chairman Brian McMaster said the resource increase will potentially drive a longer mine life and higher annual tonnage at Pedra Branca, and expects the upgrade to improve the project's economic viability. The bankable feasibility study is due to be complete by end-March. A maiden resource for Iluka Resources Ltd's Pejebu deposit, part of its Sierra Rutile project in Sierra Leone, defined indicated and inferred resources at 23.4 Mt grading 0.95% in situ rutile. This deposit is in addition to the current resource at Sierra Rutile of 7.3 Mt of rutile hosted in 701 Mt of measured, indicated and inferred resources at 1.0% rutile. Mandalay Resources Corp. has restated reserves at the Costerfield gold-antimony mine in Victoria, Australia, after discovering an error in the methodology, which led to a recent understatement of reserves. Contained gold in the restated proven and probable reserves has increased 17% over the earlier estimate to 180,000 oz, while contained antimony increased 11% to 17,200 t. Measured and indicated resources remained unchanged, the company said. For those service providers and equipment manufacturers looking further into the future, Rio Tinto has announced that it is collaborating with the newly formed Australian Space Agency (ASA) on how mining technology can be used to extract resources on moons and planets. ASA head Megan Clark said mining in space may include looking for basic resources such as water, oxygen and soil. Resources announced in January include those tabulated below.